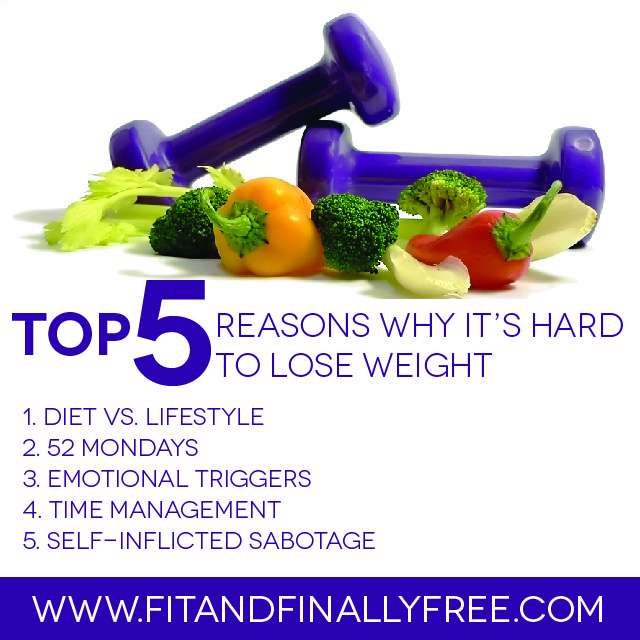 Here are the top 5 reasons why it’s so hard for people to lose weight. I will talk about each one of them. Most people approach losing weight as a diet rather than taking it on a lifestyle change. I’ve defined DIET as, “Doing Injury Eating Temporary Sustenance.” We try to eat healthy or go on a fad diet for a temporary period in our lives such as wanting to fit into a specific dress, going on vacation or attending a special event rather than making it a permanent lifestyle change. Losing weight requires a change in mindset and lifestyle. If you don’t change your mindset towards food and the reasons why you eat to live rather than live to eat, you will never lose or maintain your weight loss due to you reverting back to your old ways and habits. You have to take on a mentality of, “Out with the old and in with the new.” The word diet should no longer be a part of your vocabulary. In order to have a well balanced life, we must incorporate a healthier way of living by eating right and exercising for the duration. There are 52 Mondays in a year. When we decide to go on a diet, we tend to say we will start anew on Monday. Monday gets here, we slip up and instead of dusting ourselves off and hopping back on the wagon to live and see another day, we just say forget it…we’ll start over on Monday. There’s 6 days between Monday to Monday right? Why not just start over the next day rather than continuing the train wreck with the possibility of gaining more weight by waiting to start over on the following Monday. There will never be a perfect time nor day to decide when you will change your lifestyle. You need to be in this for the long haul. Any day is the perfect day in making up your mind that you want to live a healthier life. No one is promised tomorrow so that is why it’s so important in making good use of today. Every day is a day worth living and making healthier decisions. Life happens to the best of us. Crazy workday, children getting on your nerves and you and your significant other are not seeing eye to eye. You get a promotion, finally being able to fit into your favorite dress, or it’s a major holiday being celebrated with family and friends. Sometimes when things go awry or when things are going great, we tend to turn to comfort foods to fill the voids in our lives, make us feel better, or as an opportunity for reward. Emotional eating is not a good way to reward or face life’s problems or celebrations. By partaking in our favorite comfort foods gives us not only a temporary high in making us feel better but leaves us with a permanent low with the problem still existing and the celebration having passed. Eating our way through guilt, hurt, pain, emotional instability, happiness, love, joy and peace doesn’t solve our problems nor does it make it for a good reward. Find out what your emotional triggers are, combat the emotion and instead of feeding it, give way to it by finding other positive things to do or celebrate it without the use of food whether it be by exercise, talking with a friend, or picking up a hobby you enjoy. Food is for sustenance…not comfort. With only 24 hours in a day, sometimes it seems like we have more work, family, and personal matters to deal with than we have time. Life gets hard when you’re juggling one responsibility after another and you are being pulled in several different directions. There’s no way in giving 100% of your all without something that will go lacking. Your health shouldn’t be one of them. Time is one of the most valuable and abused intangibles that we take for granted. In order to live a well balanced and healthy life, you have to love yourself enough to use your time wisely in making the preparations to do so. So, make time to exercise, grocery shop, meal plan, prep and cook. By preparing your food and scheduling your exercise into your daily routine will not only help you to lose or maintain your weight loss but it will also help you not make bad decisions due to lack of preparation. Time is not something we can get back, but you can control how you eat and live today. At times, we can be our own worse critic and enemy. We tend to sabotage our efforts through our own negative thinking and having comfort foods within our reach. Just because things do not go right within our day or we fall short on our exercise and nutrition regimen doesn’t mean we should bash our past efforts or not acknowledge the things that did go right. Instead of feeling sorry for yourself and becoming the president of your own pity party international, withdraw your membership, surround yourself with positive affirmations, talk with your accountability partners, and rid yourself of all of the food that will cause you to go into a downward spiral. Do not become the victim but the victor in winning the weight loss war. No one said that losing weight would be easy, but in the end it all will be worth it. You have so much going for yourself and to live for. Scratch those excuses from your script as to why you can’t lose the weight and write down the reasons why you can. I can guarantee you will have more gains (in a good way) than losses. There’s no time like the present in making your permanent change TODAY!